We covered a lot of company's late-'80s NES ads in last month's Advertainment articles, but there was one double-page ad that I wanted to unpack in more depth. 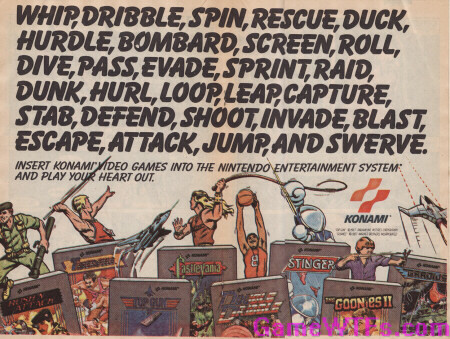 examine this Konami video game ad and verb our hearts out! Each week we'll take two of the great Konami titles and look at 3-4 of the verbs which are vaguely applicable to each game, until by the end we've covered all eight games and 28 verbs! or, The week of alternatives to writing out the word "And"
Mr. Attack is either skydiving, or he has the best balloon collection ever! There's no knife like blue knife! despite all the military hardware in this picture, 95% of your rushing and/or attacking will be limited to jabbing people with your pocket knife.